The 49 investors have issued a detailed statement calling for the protection of users’ digital rights in the wake of Facebook’s Cambridge Analytica breaches and other reports of tech companies abusing the privacy rights of users. The statement emphasizes the “growing financial and reputational risks” that companies like Microsoft, Twitter, and Yandex face because of their negligent handling of user data and related human rights abuses. This group of investors represents $700 billion in assets and is led by the Investor Alliance for Human Rights, a nonprofit network comprised of institutional investors including public and union pension funds, asset managers and faith-based investors. Led by the Interfaith Center on Corporate Responsibility, the Investor Alliance for Human Rights aims to use its clout as a coalition of global funds to influence the tech sector toward better governance. The statement issued to 22 Information and Communication Technology (ICT) companies, specifically urges the named companies to use a tool called the Ranking Digital Rights (RDR) Corporate Accountability Index in order to improve their behavior related to privacy and freedom of expression. Facebook ranked poorly in the index for issues of privacy and freedom of expression, and “disclos[ed] less about policies affecting freedom of expression and privacy than most of its U.S. peers.” Microsoft ranked lowest of all for improvement of performance. 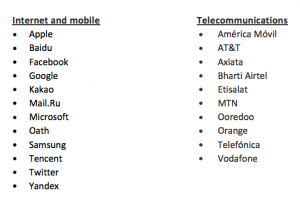 Beginning in 2015, the RDR Index has produced 3 editions of its evaluation and ranking of many of the world’s most powerful internet, mobile, and telecommunications companies. In 2018, the RDR Index found that many tech companies disclose little or no information about how they are protecting user privacy and freedom of expression. This news is particularly relevant for women in philanthropy who want to do more to ensure that digital rights are protected for all. Protections of human and digital rights are foundational to the feminist philanthropy agenda, and play a significant role in movements to reduce violence against women and ensure that women have freedom to organize politically and seek access to medical services with their privacy protected. In addition, the loss of the election for Hillary Clinton, a progressive woman candidate who would have been the first woman leader of America, appears to have been influenced by the digital breaches of social media sites like Facebook and Twitter. In 2018 alone, massive data breaches affected hundreds of millions of users worldwide. For women in particular, data breaches may increase their risk of identity theft, harassment, or loss of medical privacy. Data breaches can also contribute to targeting women for discrimination. In addition, women globally still suffer from the “digital divide” and may lack access and experience with technology in order to recover from or address security breaches they experience.